The first edition of John Stow's Survey of London was published in 1598. The second edition appeared in Stow's lifetime in 1603 and there were further editions in 1618 (edited by Anthony Munday) and 1633(edited by Munday and Dyson). In 1720, John Strype (1643 - 1737) revised and edited the classic work. He added many items which were not in the original and illustrated the chapters on the various wards of the City with highly detailed maps which are a valuable record of the streets and alleys of early eighteenth-century London. 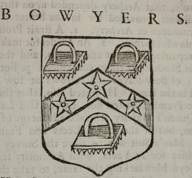 This fifth edition of the Survey includes descriptions of the closely related trades of the Bowyers and of the Fletchers which are illustrated with woodcuts of the arms of the two companies. The text has been reproduced in full with the original spelling and punctuation. THE Company of Bowyers, in Regard that the Use of the Long Bow hath added no mean Honour to this Realm of England, making it famous in far remote Nations; they may well stand on a great Privilege of Antiquity, yet their Incorporating speaks but of the 21st Year of the Reign of King James the First. Their Hall anciently was in Hart- street, in the Ward of Cripplegate Within; and, before the great Fire, upon St. Peter's-hill, in the ward of Castle- Bainard; since the Fire, they use to meet at some Public-house, to confer about their Affairs. The first paragraph on the subject of incorporation is quoted in the Prefatory Note to the Red Book and first appeared in the edition of 1633. Accordingly, for the author, the date of incorporation was very recent, being only 12 years previously. The 1598 edition locates Bowyers' Hall in Monkswell Street. It stood at the corner of Hart Street and Monkswell Street. ALtho' there is small Reason of parting Bows from Arrows, or Arrows from Bows; yet, because they have divided themselves into two several Companies, let the Fault be on their own Heads. For, as I find them, so I leave them. But, besides these two Trades belonging toArchers, there also two more; namely, Stringers and Arrow-Head-makers. All these, about the year 1570 and odd, petitioned the Lord-Treasurer; wherein they stile themselves, The decayed Companies of Bowyers, Fletchers, Stringers, and Arrow-Head-makers, as well in the City of London, as elsewhere through the Realm. They had made a Petition to the Queen before, concerning, their own decayed Condition, by Reason of the Discontinuance of the Use of Archery, and Toleration of unlawful Games and Exercises. Concerning which, Aubrey, Master of Requests, told them what the Lord-Treasurer had said upon View of their said Petition, viz. That he thought it meet and requisite a Commission should be granted to some of the chief of the Companies of Bowyers and Fletchers, Freemen of the City, as well for suppressing unlawful Games, as also for the Enforcement of the Exercises of the Long Bow, according to the Law and Statute of the Realm in those Cases provided. Upon this they preferred a Petition to him, to have due and favourable Consideration of the Cause of their Complaint, with their decayed Estates; and to vouchsafe, that the said Commission might be granted to them, according to his Lordship's former Model, and as certain Notes ready to be shewed him did import. In the Year 1576, one Ralph Lane, a great Projector in those Times, would have monopolised to himself this Commission for the Restoration of Archery. He shewed, in his Paper put in for that Purpose, that Archery depended upon three special Points, provided for in the Statute, for the Maintenance of Archery. 1. A strict Prohibition of unlawful Games. 2. An Order for Making up and Repairing of Butts and Marks, and the Exercise of Shooting at Times convenient. 3. For a Provision of Bow-staves and Arrows at low Prices, rated in the same. He noted also, that the Pains of the Premises rested not, by the said Laws, in the Queen's Majesty, to take Advantage of, or to pardon, but in the Lords Leets and Franchises. This Man's Suit was to have the Survey of the Premisses for twenty-one Years, with Authority sufficient to enjoin Men lacking the same, to take the Supply of their Lacks of Bows and Arrows at his Hand, at the Prices of the said Laws, and not above; and also like Authority, as far as in her Majesty lay, by taking the Penalties, and the Punishments of unlawful Games, in such as he should find, upon the Survey, to continue the Use of them, or to release the same to such as should conform themselves to the contrary, and would take Bows, as was aforesaid; whereby they might be both forced and allured to exercise Shooting at Times convenient, and also to keep up the Butts and Marks, as the said Laws did appoint. The Statute, for the Maintenance and Exercise of Shooting in the Long Bow, was made, Anno 1541, in the 33d of Henry the Eighth. It was upon the Ground of this Statute, that the abovementioned Petitions were built; as was also a Commission in the 13th of Queen Elizabeth, Anno 1570; wherein the appointed Commissioners in each County for the Reformation of the Use of unlawful Games, and for the Maintenance and Exercise of Shooting; which Commissioners were to take due and lawful Search in every Place within each County, as well for such as used unlawful Games, as also whether every Person for himself, his Servants and other Youth in his or their several Houses, had sufficient Furniture and Provision of Bows and Arrows, and had not occupied the same according to the Meaning of the said Statute of Henry the Eighth; but, notwithstanding this Commission to see the Abuses reformed and corrected, in many Parts the Use of shooting was never the more frequented or used, and the Faults as many as they were wont. Upon this the Queen issued another Commission, in the 14th of her Reign, Anno 1571, viz. That these Commissioners should, within forty Days after the Receipt of those Presents, certify unto the Lord-Keeper or Lord-Chancellor for the Time being, in how many Towns and Parishes in the said County they had executed and performed the Effect of the said Commission, and in how many not; and also the Names of such Persons, whom they had or should find offending in the Premisses, together with their respective Offences in that Behalf, in Writing under their Hands and Seals, to the Intent that further Order might be taken therein; but this Commission, though it was fair transcribed in Parchment, yet was not signed by the Queen; but only examined by Sir Gilbert Gerard, her Attorney-General, whose Hand is set at the Bottom. For the Supply of this Nation anciently with Bow-staves made of Yew, the Italian Merchants, by an old Statute provided in Edward the Fourth's Time, were bound to bring in Bow-staves into England. One Middlemore had a Commission from the Queen, to see to the Performance of this Statute. The Penalty whereof by his Officer, one Wanton, was required now of the Italian Merchants, and particularly of one Diogenes Francischini, and other Merchants of Venice; who were fain to make a Complaint by Way of Petition to the Lord-Treasurer; shewing, that this Bringing in of Bow-staves was a Matter of long Time not used, and so not provided for by them, the Italian Merchants; and also became impossible, for that the Country from whence Bow-staves were had in King Edward the Fourth's Days, had been in the Turks Possession, and none were within any of their Trades; so that they could not perform that which then might have been, nor did know any such Course of Traffic, how to come by them; but was a Matter wholly discontinued, as impossible. Yet in former Times, to supply this Defect in our country, the Italian Merchants touched at Spain, where they took in Bow-staves. The People of Castille on Purpose destroyed their Woods, and provided by Law, that no such Wood, as Yew, should be preserved; but notwithstanding it was urged by Wanton aforesaid, that these Italians should be compelled to bring in Bow-staves from the Parts adjoining to Venice and thereabouts; because the finest and best Yew came from thence, and because their Trading for Bow-staves with that People would encourage them to plant and cherish that Wood, as they did Vines and Currants, that is, for Traffic-sake.